Function and Beauty Meet to Create a Vibrant Garden Expanse. Troy Rhone’s team approached this landscape design project with an eye on ensuring it matched the interior design of the client’s house. He created a stunningly beautiful garden that blends the inside with the outside. The end result is a series of “garden rooms” that flow together but also exist as their own distinctive segments. While every garden room has its own identity, they are all intricately blended as well. In addition to being a beautifully designed garden, it is very functional for the owners. Practical additions, like benches and a workshed, meet their everyday needs. Troy’s team also included rain barrels to store nutrient-rich rainwater. The landscape design provides plenty of space for fresh vegetables and cut flowers—making it a working garden. 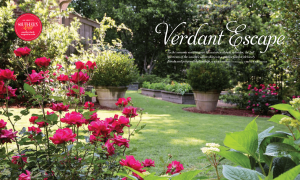 See the full article “Verdant Escape” in Southern Lady magazine for additional details on the flowers and plants used for this landscape design. 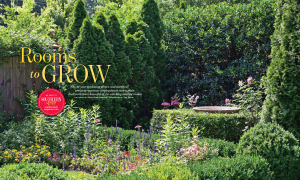 Get to know Garden Designer Troy Rhone in this intimate interview featured in Flower Magazine. Many gardens are taking the modernist garden design approach today. 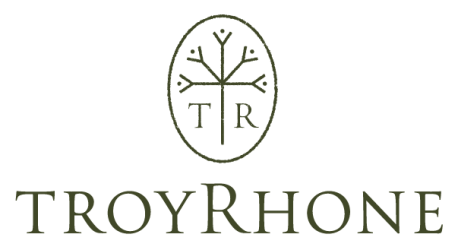 However, Troy Rhone designs with a decidedly British accent, creating garden rooms with layered borders and expanses of green lawn. His designs feature impactful compositions and trained vines. In this uniquely up-close interview with Troy Rhone, he delves into his history and his inspirations. The work of the early English landscape designers Vita Sackville-West and Gertrude Jeckll were two profoundly influential garden designers who affected the development of Troy’s style. What’s this garden designer’s favorite flower? Antique roses. Some of his favorites include ‘Crystal Fairy,’ ‘Perle d’Or,’ and ‘Climbing Pinkie.’ Troy loves them because they’ll thrive even with some neglect — so you enjoy all the benefits without the commitment. Troy explains how he sees the modern world’s obsession with possessions as a tragedy. In our busy lives, we’re missing the cultural relevance of gardening. Read the full article “Down the Garden Path” — published by Flower Magazine in June 2016. See how Troy Rhone designed the gardens for Birmingham steel heiress, the late Barbara Ingalls Shook. These remarkable gardens are a tribute to the equally remarkable woman. 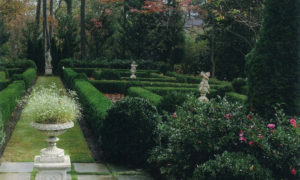 From daffodils to irises, Letten roses to tiny boxwoods, Troy created a masterpiece landscape design fitting for the late heiress. While Parterre style gardens are generally designed to show symmetry and order, Troy included less traditional additions to this landscape design—including wide-open, sunny spaces. This garden, while formal, also memorializes the unconventional woman. It is a garden truly inspired by her. Read the full article “Living Legacy”—originally published in Feb/March Garden & Gun magazine 2016. Turn a Plain Backyard into an Eye-catching Outdoor Room! A little bit of planning goes a long way to create a botanical paradise. Garden Designer Troy Rhone designed a series of outdoor rooms for this special garden—giving them as much attention as he would any interior space. A stone path leads the way from the house to the garden, punctuated with a pair of gates that separate individual spaces. Troy filled the area with colorful annuals and hardy perennials. The end result feels like a delightful English garden, rambling yet composed. A birdbath centered on the back fence even attracts avian visitors. 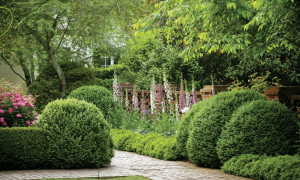 The garden was featured in the garden design section of the magazine Southern Lady in 2014. See additional pictures and read the full article “Rooms to Grow” in Southern Lady Magazine. This cohesive approach is perfectly reflected in Mountain Brook, the personal home of the Keeblers. This English cottage garden landscape design features traditional stone accents and a stunning, rich palette of bright colors. Despite sitting on a hill, Troy did an impressive job making the house look level with the grounds. He widened the driveway and added brimming planters. The explosive colors in the window boxes provide breathtaking color and ground the windows. Key to any design is truly knowing his clients. To this end, Troy spends extensive time with the homeowners, allowing the story of their garden to evolve. As he comes to know their personal taste, he senses their style and works off that. 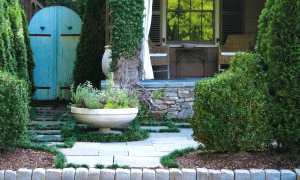 “Every garden has a story to tell, and every client has a story to tell as well,” says Troy. 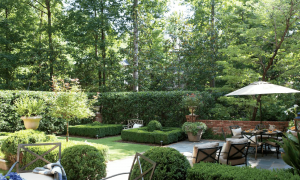 See pictures of the stunning final results and read the full article “Cottage Garden” — published in Alabama Magazine, April 2014 edition.